Patient is a 12 year old black male who initially presented with a history of left knee pain for 4 months. He denied any obvious history of trauma, but he claimed to play a lot of basketball and felt that the pain was worse after playing. Patient also claimed to have a "knot" over the anterior aspect of his proximal tibia. On physical examination the patient had a prominent tibial tubercle which was swollen and tender. The knee did not have an effusion, and there was no joint line tenderness. There was also no tenderness over the patellar tendon. There was full range of motion in the knee, but the patient had hamstring tightness. He also had pain with resisted knee extension. There was no instability to varus or valgus stress. McMurray test was negative. Lachman test was negative. Patellar tracking was normal, and there was no pain with loading of the patellofemoral joint. 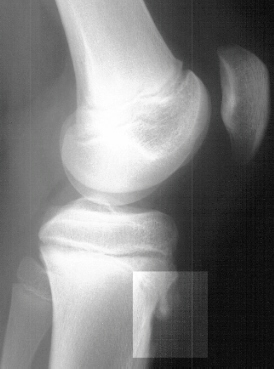 Xray of the left knee revealed an ossicle anterior to the tibial tuberosity . Patient was diagnosed with Osgood-Schlatter disease and told to refrain from playing ball for 4 weeks. He was also given a prescription for Motrin. The patient continued to play and returned complaining of increased pain and tenderness at the tibial tuberosity. The patient was then placed in a knee immobilizer for 4 weeks to be removed for stretching exercises. At his most recent follow-up, the patient's pain is resolved , although he continues to have pain with kneeling on the knee or contact on the tuberosity. Most commonly accepted: microavulsions caused by repeated traction on anterior portion of developing ossification center of tibial tuberosity. Inflammation and reparative changes cause pain , swelling, tenderness. CT/MRI: changes at insertion of patellar tendon. U/S: Thickening of patellar tendon near insertion (more echogenic). Excision of ossicles with or without excision of prominent tubercle (Thompson-Ferciot tubercle thinning procedure) can give 85-95% good results (Binazzi, et al; Flowers, et al; Mital, et al). Better results than drilling of tubercle or reattachment of non-union. Binazzi, et al. : Surgical Treatment of Unresolved Osgood-Schlatter Lesion. CORR 289:202, 1993. Flowers, et al. : Tibial Tuberosity Excision for Symptomatic Osgood-Schlatter Disease. JPO 15:292, 1995. Krause, et al. : Natural History of Osgood-Schlatter Disease. JPO 10:65, 1990. Kujala, et al. : Osgood-Schlatter's Disease in Adolescent Athletes. Am J Sports Med 13(4):236, 1985. Lanning, et al. : Ultrasonic Features of the Osgood-Schlatter Lesion. JPO 11:538, 1991. Lynch , et al. : Tibia Recurvatum as a Complication of Osgood- Schlatter's Disease: A Report of Two Cases. JPO 11:543, 1991. Mital, et al. : The So-Called Unresolved Osgood-Schlatter Lesion. JBJS 62A(5):732, 1980. Ogden, et al. : Osgood-Schlatter's Disease and Tibial Tuberosity Development. CORR 116:180, 1976. Rosenberg, et al. : Osgood-Schlatter Lesion: Fracture or Tendonitis? CT and MR imaging features. Radiology 185:853, 1992. Trail, et al. : Tibial Sequestrectomy in the Management of Osgood-Schlatter Disease. JPO 8:554, 1988. Wiss, et al. : Type III Fractures of the Tibial Tubercle in Adolescents. J Orthop Trauma 5(4):475, 1991.